The northern part of the Dordogne, stretching towards the Limousin to the north and Charente to the west, is named Perigord Vert (green Perigord) because of the greenery of the forests and meadows of the region. This region, around Nontron, is a region of unspoiled scenery split by fast moving streams, rolling hills and great rocky plateaus. Nontron, famous for its knives, is the largest town in the Perigord Vert (it is though just a small town). The highlight of the Perigord Vert region is the beautiful town of Brantome and its abbey. 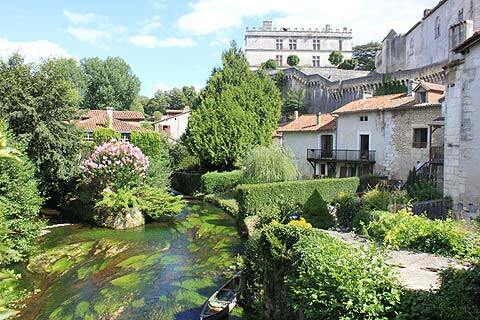 Near to Brantome is the "most beautiful village" of St-Jean-de Cole and also the attractive village of Bourdeilles. Nearby Thiviers is known as the capital of Foie Gras, a delicious speciality of the region and not to be missed. Whilst Riberac is a thriving market town. Another favourite town is Excideuil and close to here the recently discovered Grotte de Tourtoirac. There are four chateaux and two abbeys to visit in the region: the Chateau de Jumilhac, the Chateau de Bourdeilles, the Chateau de Puyguilhem, the Chateau de Mareuil, the Abbey at Brantome and the Abbey of Boschaud. Just outside of the Dordogne department in the Charente department is the amazing village of Aubeterre sur Dronne which has a church hewn out of rock and is counted amongst the "most beautiful villages" in France. The Regional Natural Parc of Perigord and Limousin also falls partly in this region. For the other parts of the Perigord see: Perigord Noir, Perigord Pourpre and Perigord Blanc.